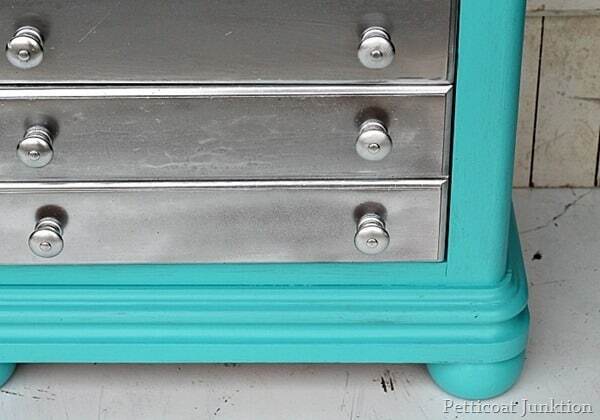 You can spray paint furniture metallic silver and then add turquoise to spice it up. I don’t normally use spray paint on furniture but I couldn’t resist. I think it’s okay in small doses but I wouldn’t paint a big piece of furniture with spray paint. How pretty is that?? 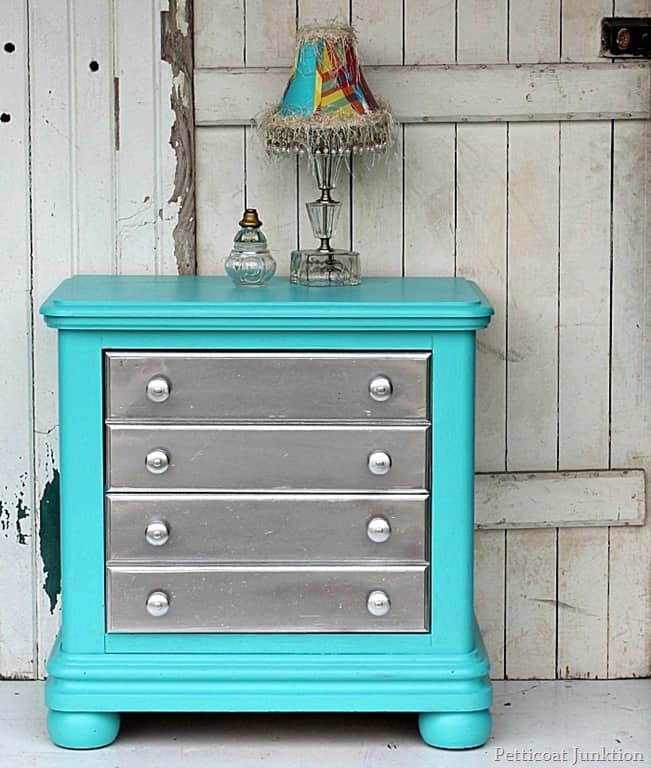 The metallic silver is the perfect contrast to the bright turquoise. I thought of using pink instead but glad I went with the turquoise. Valspar paint color Rushing Stream. I was in Lowes this past week buying plants for my diy chair planters when I walked by the Valspar color sample display. I grabbed the brightest and prettiest of the color samples and headed for the check out stand. The color is Rushing Stream. This nightstand has been sitting in the workshop for awhile. It came from My Favorite Junk Shop. I seriously don’t know what I will do if that place ever closes down. It’s Heaven for a junker like me. If you ever make it to the Hopkinsville, Ky area you need to check it out. 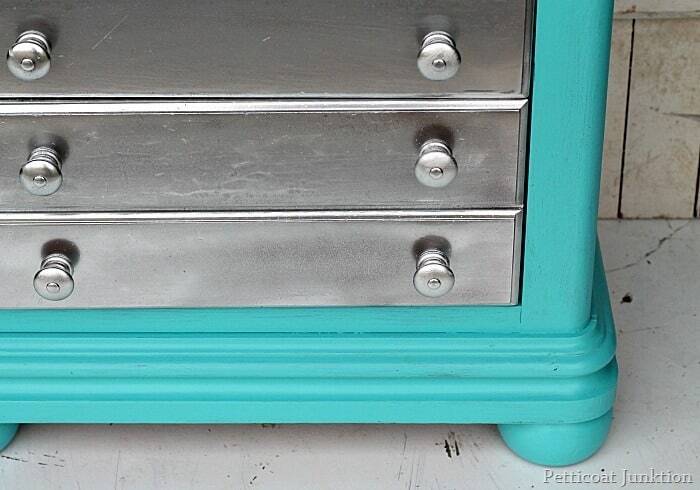 I spray painted the drawers and hardware metallic silver. 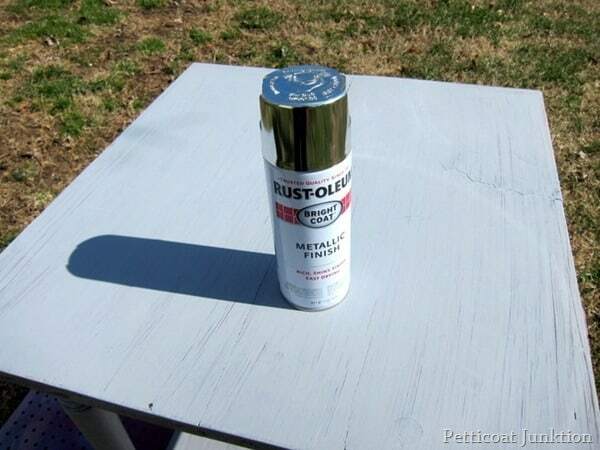 I used the same Rust-Oleum Bright Coat Metallic Finish I used on my Polka Dot Table. I have about 6 different spray paint containers of “silver” colors and this one is the best. The paint flows so well and covers like I brushed it on. There aren’t the splotchy areas like you get with some spray paints. The color is very even. The Rushing Stream is a really pretty color. It’s a turquoise or aqua depending on your definition of those colors. I used two coats of paint and still have paint left in that little sample jar. It goes a long way. It looks great with the metallic silver. I spray painted the knobs too. I like the fact that they blend in. The nightstand was a little rough in places and you can really see it with the metallic paint. The finish on the nightstand had the little dark raised flecks to make it look aged. The flaws add another dimension to the overall look so I think it works. At least for me. What do you guys think? I only used about a third of the paint sample so there will be more “Rushing Stream” projects in the future. 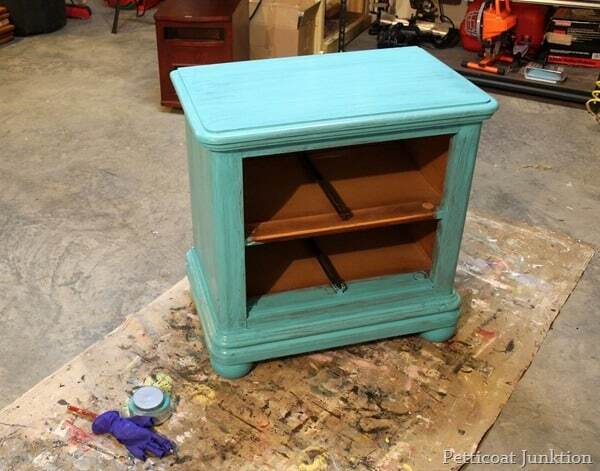 If you like turquoise paint you will love this project. It was a custom piece for a sweet girl heading off to college …. Custom Blue Chest. So, is the sample paint pot a chalk paint? I need to start looking at those! By the way, LOVE the turquoise with silver…reminds me of a piece of jewelry! No, it’s latex paint. Yes, the little samples are nice and sometimes they have oops sample size paint. It’s only 50 cents. Girl! I love metallic furniture. It’s very popular right now. Did you sand or prime the table before spray paint or paint? Did you sand the piece first or prime it? Or, did you mix the paint with something to make it stick? Asking because I have some oft these samples but I thought you had to sAnd or prime the furniture first? 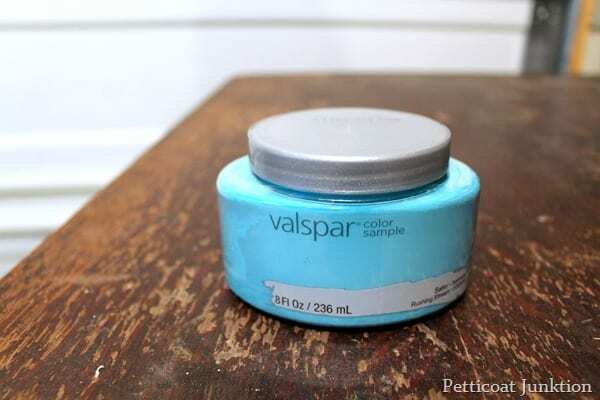 I have several Valspar free samples but I love this turquoise! It looks great with the metallic… sometimes when a piece is ALL metallic it’s a bit too much (especially for my boyfriend) but this is a great combo to incorporate a bright color and some sparkle! Nice job! Looks fantastic! 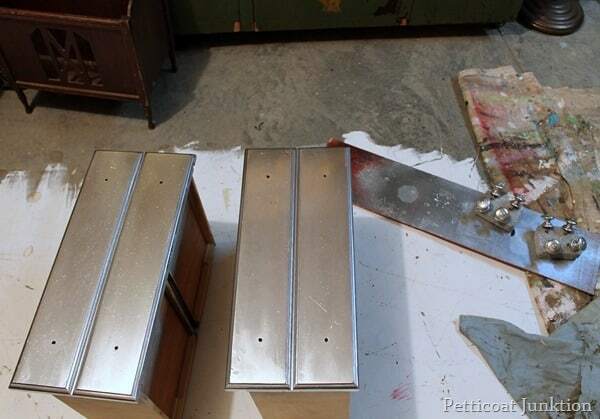 Do you need to prime the drawer fronts first before spraying with the metallic paint? Wow look at that!. It is gorgeous, flaws and all. I like the silver a lot. Home Depot and Lowe’s usually have paint testers that people rejected or that didn’t come out right for sale, anywhere from 50 cents to a couple dollars. I always stop by and look at what they have. Of course there’s always a lot of beige (booooooring…. ), but every so often I score a bright green, or purple, orange…. I have been able to amass quite a collection this way. OK that’s AWESOME Kathy! Love the shimmer with the blue! Gorgeous Valspar color! LOVE….and that metallic is luscious! Really! The Valspar free samples are the main reason I kept a hard copy BHG subscription instead of switching to a digital one. Did you know you can get a custom color sample (using any Valspar color chip)for free with the coupon? It doesn’t have to be premixed on the shelf :). Very cute & you know it’s all about the cuteness!! 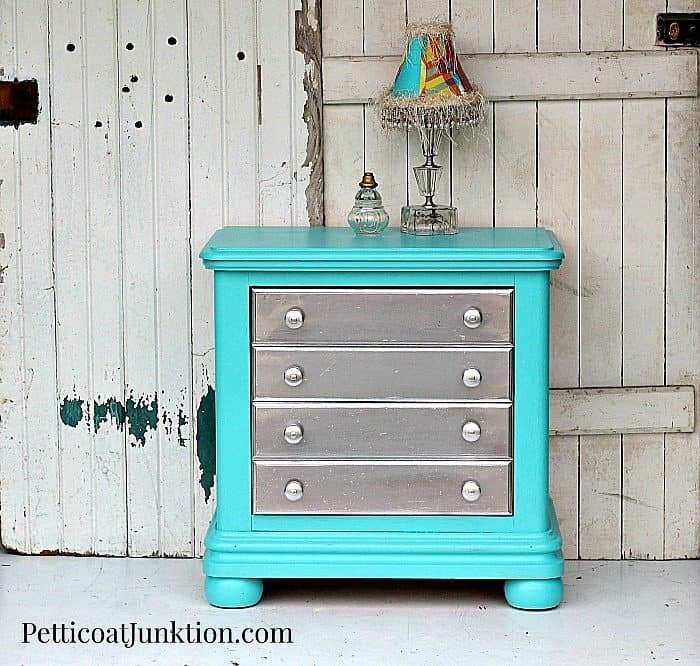 Love the turquoise and silver combination on your dresser. I also have a coupon and need to remember to redeem it for this color. Hit it big again girlfriend. I love the combination of colors, a bit like my turquoise jewelry. Have a great day. I love the free samples! I get them too in magazines now and then. I even buy that size as I love the Valspar line. 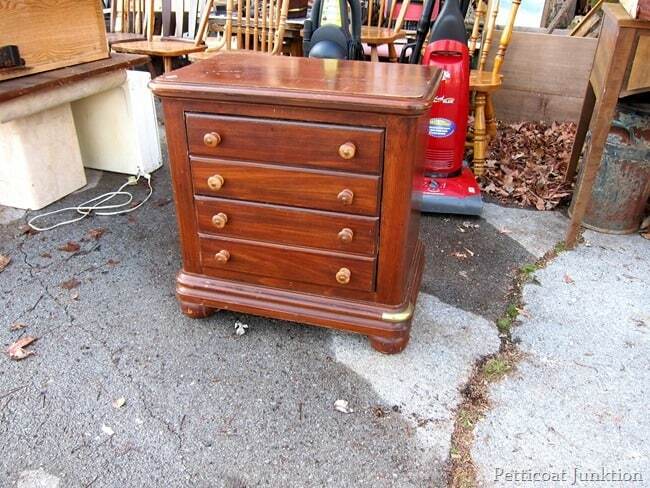 I have a nightstand that would look wonderful with the silver accents. Thanks so much for your inspiration! Great job and such a pretty color!! !